This tutorial describes how to implement a drag/drop operation between a custom data-bound RadDiagramToolbox and a RadDiagram. For the purpose of this tutorial we will create e sample Grid with two columns - the first one holding a RadDiagramToolbox and the second one - a RadDiagram. You can find the DataContext implementation and the Resources section of the Grid in the DiagramToolbox - How to Populate RadDiagramToolbox with Custom Data Items section. 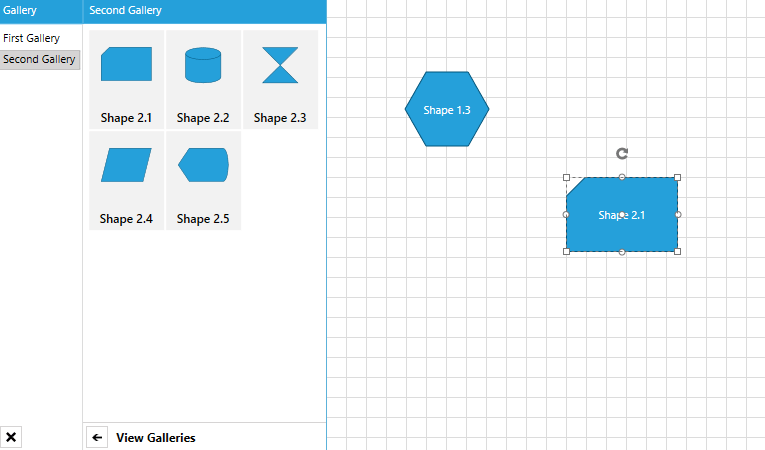 If you run the application at this stage, you will be able to drag shapes from the toolbox and drop them onto the diagramming surface. This is due to the built-in support for drag/drop operations between the RadDiagramToolbox and the RadDiagram components. As the RadDiagramToolboxItems are marked as draggable by default, as soon as a drag operation is initiated, the DragDropManager DragInitialize event is fired. The Diagramming Framework handles this event internally and creates a DiagramDropInfo object that describes the dragged shapes. This process is further described in the DragDrop Support section of the RadDiagramToolbox article. Once a RadDiagram instance receives a drop of a DiagramDropInfo object, it uses the SerializationService to retrieve the settings of the dragged RadDiagramItem and to create a new item in its Items or GraphSource collection. However, please note that the dragged shapes don't keep their original Geometry once dropped. Instead the drop operation creates a rectangular shape in the RadDiagram. This is due to the fact that the SerializaionService does not serialize the Geometry property of a RadDiagram(Container)Shape. Instead, you need to manually serialize the property and retrieve it after the drop operation. For that purpose, we need to first attach an event handler for the default SerializationService ItemSerializing event. The default SerializationService is the one internally handling the serialization of the dragged toolbox shapes and once you attach a handler for the ItemSerializing event, you will be able to plug into that serialization and serialize more properties of the RadDiagram(Container)Shapes. Next we need to deserialize the Geometry property after the end of the drop operation. As the RadDiagram receives a DiagramDropInfo object, it knows that there is a serialization information that has to be processed. This is why a drop operation originating from a RadDiagramToolbox fires the RadDiagram ShapeDeserialized event. And you can attach a handler for it in the RadDiagram definition and deserialize any set of custom properties that you have manually serialized. Now that we have configured the Geometry property serialization, we can go ahead and serialize more properties of the dragged shapes. For instance, in this example, the RadDiagramToolbox is populated with MyShape business items. The Header of these items is displayed underneath each shape in the toolbox and we can serialize it to use it as a Content of the dropped shape on the diagramming surface. 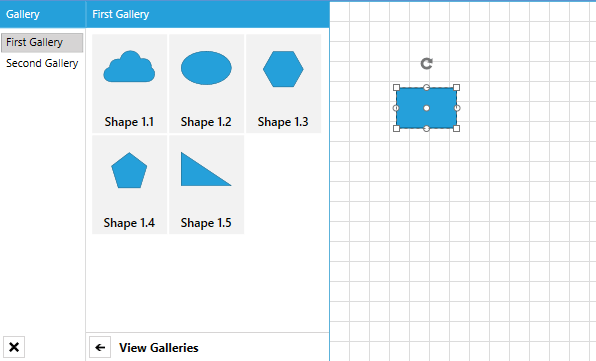 If you run the project now, you will be able to drag shapes from the toolbox and drop them in the diagram. 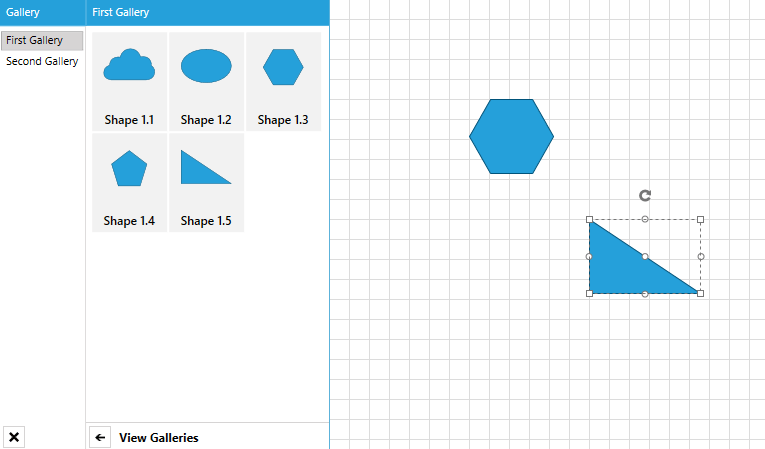 The shapes will keep their Geometry and they will display the original Header data property as their Content. You can download a runnable project of the demonstrated example from our online SDK repository here, after navigating to Diagram/CustomToolboxDragDrop.